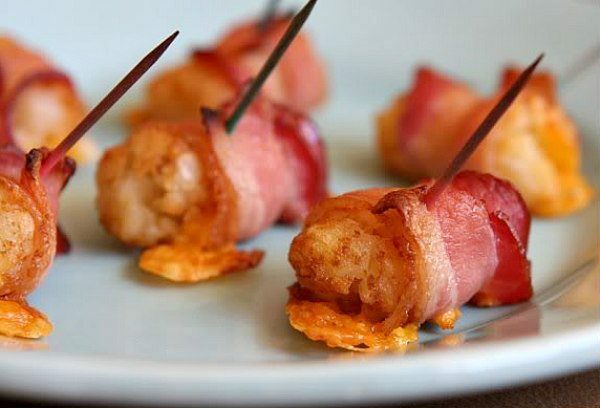 These Bacon Wrapped Tater Tots are quick and easy appetizer recipe for you that requires only 4 ingredients: bacon, tater tots, cheddar cheese and Tabasco sauce. This recipe is perfect for football season! The best thing about game days (besides watching those guys in tight pants running around the field with a football) is definitely the food… comfort food of all sorts… food you’re willing to sacrifice extra time at the gym for… food that you only treat yourself to on Sundays. Watching football wouldn’t be quite right without comfort food, would it? 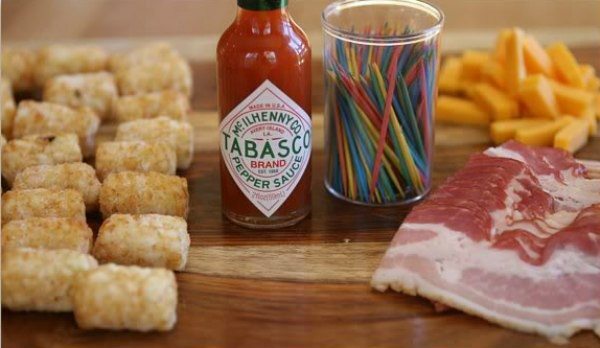 The key ingredients: frozen tater tots, Tabasco sauce, sharp cheddar cheese and center-cut bacon. Are you a fan of Tabasco? Do you douse your scrambled eggs with it, drizzle it on your pizza or pour it into your Bloody Mary? I’m always curious to know how people use this stuff. Well, Tabasco sauce is the secret ingredient here, so don’t even think of leaving it out. It enhances the flavor of these little bites, taking them from ho-hum to woo-hoo! These are so easy to assemble! Secure with a toothpick and place on a baking sheet. Bake at 450 for about 15 minutes, until tater tots are cooked through and bacon is crispy. 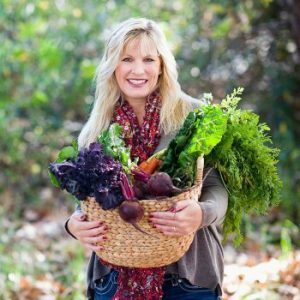 Drain on paper towels to rid these little bites of any excess fat. Serve immediately! If you’re feeling adventurous, you can try one of the suggested variations in the recipe below. Include a pickle for a little bit of a salty addition. Roll the original in brown sugar before baking. Or stuff with cream cheese and peperoncini instead. This appetizer rocks. It’s easy to assemble, it’s kid-friendly, and football fans will devour these in no time at all. In our house, the hands-down favorite was the variation where you roll the original in brown sugar before baking. The flavors of sweet, smoky, and spicy were a delicious combination. 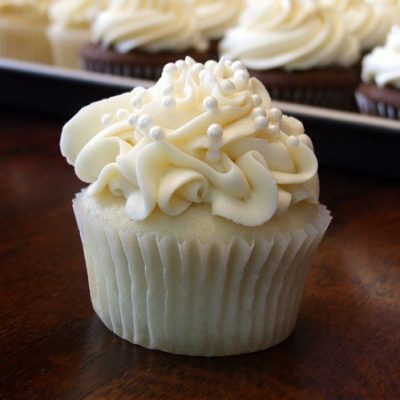 Click below to watch a short video showing you how to make this recipe, then scroll to the bottom to print out the complete recipe. 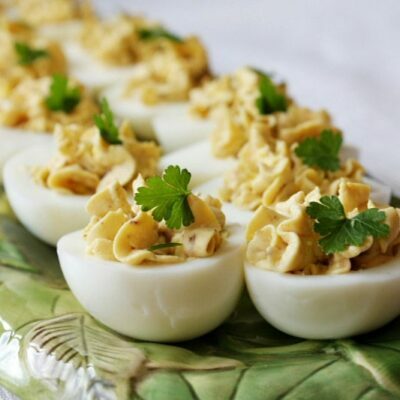 This appetizer is a fun one for sports-themed parties like Super Bowl. 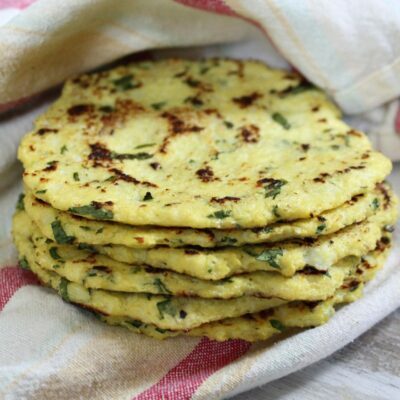 They're simple to make and will be quickly devoured by your guests! Preheat oven to 450 degrees F. Line a baking sheet with parchment paper or spray with nonstick spray. Lay a piece of bacon on a flat surface. Place a tater tot on top. Using a sharp knife, gently cut a slit down the center of the tater tot. Wiggle a piece of cheese into the slit. Sprinkle Tabasco sauce on top. 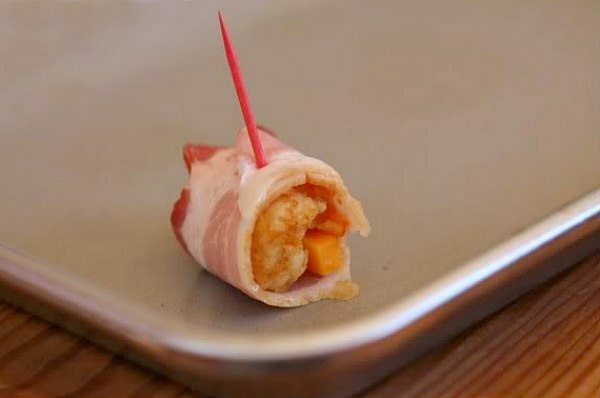 Wrap bacon tightly around the stuffed tater tot and secure with a toothpick. Repeat with remaining ingredients. Bake 15 minutes, or until they appear to be cooked through and the bacon is crispy. Serve immediately. Tater tots are found in the frozen section- Ore Ida makes them. 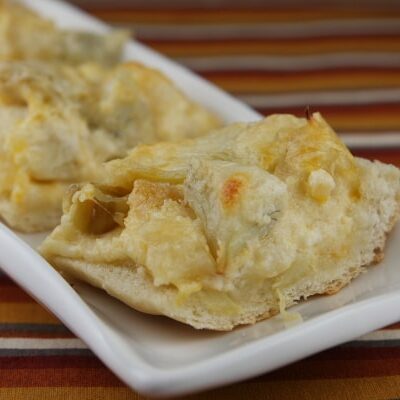 Variations: add a piece of pickle on top of the cheese. Roll the bacon-wrapped tater tot in brown sugar before baking to add a little sweet flavor to this (my favorite way to make these)- just make sure you don't over-bake them though or the sugar will make them burn. Or try replacing the cheddar cheese with cream cheese and a piece of peperoncini. Make ahead tip: Assemble these a few hours ahead, place them on a baking sheet, cover with plastic wrap and bake when ready. 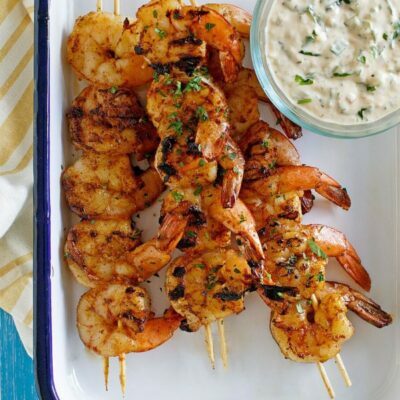 Try serving them up with a spicy sour cream dip- sour cream mixed with a little bit of Tabasco sauce. 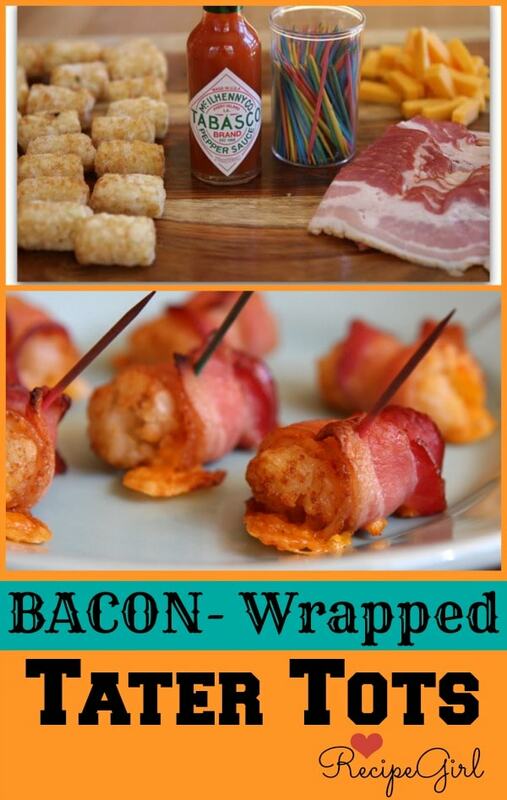 Bacon wrapped tater-tots?!? What’s not to love? 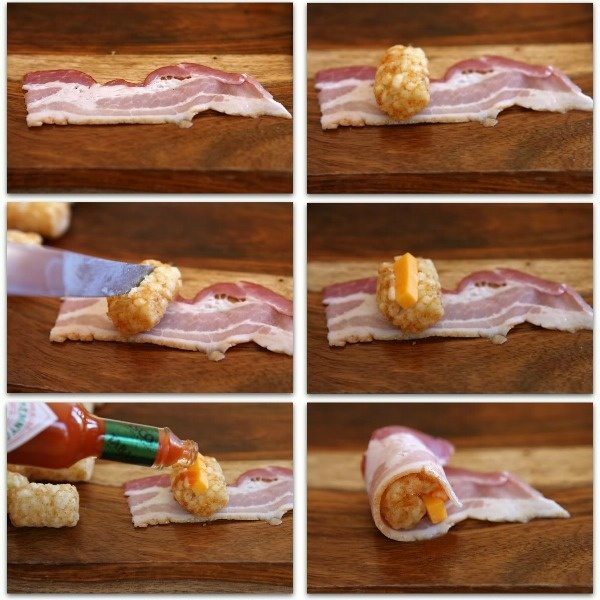 I am thinking that the bacon & tater tots don’t cook in the same amount of time…..doesn’t the bacon come out still mushy? 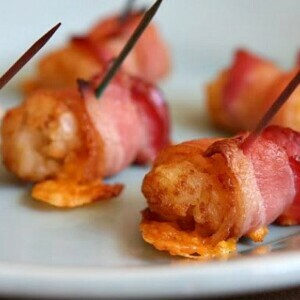 Would it be an idea to partially cook the bacon first in a frying pan & then wrap the tator tots with it?? No- they work out as the recipe is written! I tried these the other night and one pan was not enough! The smell in my house was insane! My kids were literally bartering for the last few – lol. That’s a good point Lori. Now that I think of it, we have a small toaster oven that I may be able to use to rewarm them. they may stay crispie enough if I make them at home in the a.m. before coming to work. Thanks! Can these be baked ahead and then reheated in a microwave? I’d like to bring these to an office party but we do not have an oven – just a microwave. Thanks for the great recipe! I’m sure they can. I’m not certain how great they’ll be that way since when they’re fresh out of the oven they are nice and crispy. The microwave might make them a little soft. It would be really helpful if you included the Nutrition facts with the recipes. 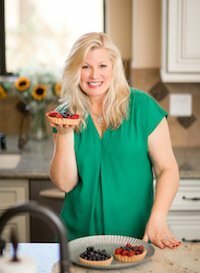 It’s included on all of my weight watcher and low fat category recipes, but not sweets and others. I saw these on the Food Network last week, except they had a jalepeno indide and cheese on top and were deep fried. OK, maybe it wasn’t exactly the same. But I just think they’d be so yummy! !